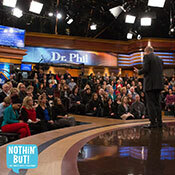 Dr. Phil and his guests get a chance to walk in someone else’s shoes. Dr. Phil and his sons, Jay and Jordan, check in at the Richard Petty Driving Experience, where they learn what it takes to be a professional racecar driver. First, they each ride along for a couple laps around the racetrack, learning some features inside the racecar and on the course. Then, it’s their turn. Dr. Phil, Jay and Jordon get suited up and into their racecars. While racing each other around the track, Dr. Phil exclaims, “Boy, you got to learn to power into those turns or this thing will absolutely get away from you!” After a few laps, they come back in. “I want one of these,” says Jordan. Next, Dr. Phil and his sons meet four-time NASCAR champion Jeff Gordon. “You do this every day? And you get paid for it?” Dr. Phil asks. “And I get paid to do it,” laughs Jeff, who explains that now he’s going to get on the radio and instruct Dr. Phil as he races around the track. Jeff radios Dr. Phil and gives him some tips while he races behind another car. “How’s that workin’ for ya, Dr. Phil?” asks Jeff. “Like a dream, baby!” replies Dr. Phil. “Now we’ll give you a real ride and see how you like it,” Jeff tells Dr. Phil. “Actually, I didn’t,” replies Jeff. “Oh, great,” says Dr. Phil. Jeff informs him that if at any time he feels uncomfortable, all he has to do is wave his arms around, and they’ll slow down. 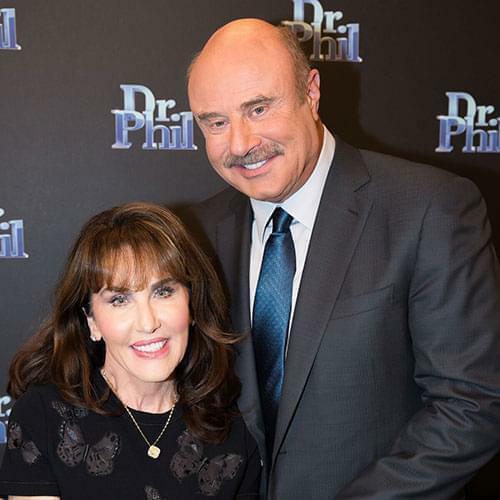 “I’m good as long as we keep the dirty side down and the shiny side up,” says Dr. Phil. They speed off. When Jeff asks Dr. Phil how he’s feeling, Dr. Phil gives a thumbs up. While driving “wide open,” another racecar comes up beside them and the two cars touch paint. Dr. Phil’s mouth drops open. Jeff moves the racecar up to the wall of the track and Dr. Phil smiles nervously. “Hey, you look a little white to me,” says Jeff. Bryan, spokesperson for the Richard Petty Driving Experience, presents Dr. Phil with his official race time and a signed helmet from Richard Petty. 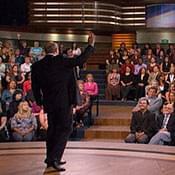 He informs Dr. Phil that his top driving speed was 145 miles per hour!